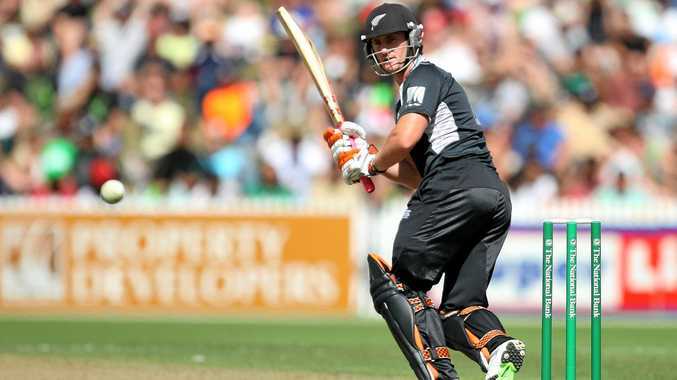 NEIL Broom will replace Martin Guptill in the New Zealand Twenty20 squad to play Bangladesh, after the opener suffered a left hamstring injury in the final one-dayer at Nelson. Guptill strained the muscle scampering for a single to mid-off in the third over of the Black Caps' successful chase of 237. He will be sidelined for two to four weeks. The hope is he will return for the home Chappell-Hadlee series against Australia at the end of the month. The opener's reaction gave the impression he'd stepped on a rogue Lego brick in bare feet as he pulled up lame. Physio treatment had him back to working order for four deliveries at the non-striker's end, but he limped off by the over's end. Broom comes into the 13-man squad with the first of the three matches starting in Napier on Tuesday. New Zealand could have opted for someone like Jimmy Neesham or Luke Ronchi to act as a makeshift opener but that had the potential to be counter-productive to the side's balance. Broom, after an outstanding return in ODIs with scores of 22, 109 not out and 97 against the tourists, was the obvious contender to join Kane Williamson at the top of order. He has batted at No.3 for Otago in five out of six McDonald's Super Smash innings, amassing 206 runs at an average of 51.50 and strike rate of 140. He has scored two half-centuries and made less than 23 just once in the competition. Given the way Broom and Williamson worked in their first international together, posting a record New Zealand ODI second-wicket partnership against all countries of 179, the transition bodes well. "Martin's obviously a key player for us with the white ball so to lose him is disappointing,” coach Mike Hesson said. "We're confident with some rest, followed by a couple of domestic games (in the Ford Trophy), he'll be ready to play a big role against Australia.